Tim is one of the many volunteers of this ministry. We are glad to have his involvement in the development of creative living spaces for the elderly in Roswell, New Mexico and throughout the U.S.
Tim continues to support the ministry through visits to homes both here and abroad. The New Mexico branch of Forgotten Saints Ministry is headed by Tim Parker. As mentioned before, Tim's history with the ministry goes back a long way. He was instrumental in the beginning of the Australian ministry and continues to expand awareness of Forgotten Saints in New Mexico. One would expect that nursing homes and other facilities would be concerned with every aspect of their residents’ well-being. The sad reality is that, for many facilities, the “spiritual equipping of the saints” is usually an afterthought delegated to an Activities Director to implement. Fortunately, we’ve been available to provide more effective and complete services for many of them. Residents are our priority but our relationships with the managers, directors and owners of the facilities where Forgotten Saints ministers have always been important to the overall success of our outreach and ministry efforts. For this reason, Chaplain Ed and Tim Parker began twelve years ago to try to encourage builders and owners to incorporate assets for spiritual ministry to their residents into a project even before it begins construction. We’ve had the pleasure of working with several developers over the years with the result of Chapels and Bible study rooms being added to their facilities. Having a place to minster isn’t enough though. A home needs a director and workforce who are aware of and trained in spiritual ministry to their clients. Our team has been able to provide this training for receptive management teams and workers. We’ve taught many to be creative in the use of an under-planned facility with limited resources. Limitations need not be an excuse for not ministering spiritually to residents. Tim continues this type of work in Roswell, New Mexico and has also branched out into providing independent living facilities for elderly people capable of living outside of a group facility. His work is not directly with residents but is definitely for their benefit. Join us in providing an enriching church experience to people who appreciate it the most. Visitors and volunteers are welcome anytime. If you come once, you'll make it a habit. 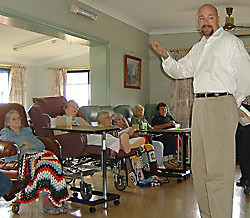 We look forward to seeing you at one of these Greensburg, Pennsylvania nursing homes led by Clyde Bittner.